Companies that consistenly deliver on sales targets execute on the right combination of sales and marketing tactics to drive performance. In order to deliver meaningful and measurable results from your B2B marketing, it’s important that you utilize all of the tools available to you. This means social media sites, email marketing, content, and the phone. If you’re not using all of these resources, you’re missing out on ways to connect with prospective clients. Introhive, a relationship data science platform, recently created an amazing infographic that demonstrated how to use these tools throughout the awareness, lead generation, lead nurturing and sales generation phases of the buying process. Here’s what we learned. 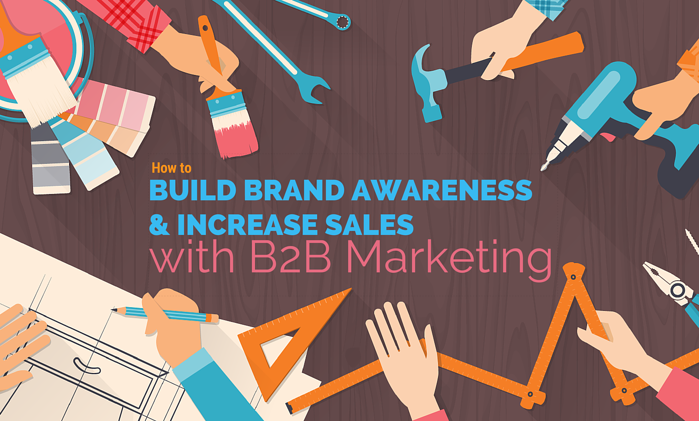 Content, social media, and email are big parts of the awareness-building phase. According to TMG Custom Media, 90% of consumers find custom content useful. What’s more, 78% believe that organizations providing custom content are interested in building good relationships with them. If you’re not actively blogging and creating gated assets, it’s time to get started today. Infographics, webinars, blog posts and eBooks all drive new visitors and build brand awareness. When it comes to social media, utilize LinkedIn, Twitter, Facebook, SlideShare and YouTube to gain online visibility. Use LinkedIn to connect with potential prospects and share content. Use Twitter to share quality content and establish brand awareness. Use Facebook to increase brand awareness through unique content and retargeting. Use SlideShare to build a quality deck to share with prospects. Use YouTube to share product demos, explainer videos, and tutorials. Last but not least, utilize email marketing to reach out to prospective clients and get leads on your radar. Lead generation tactics should include a mix of content, social media, email and phone. Here’s why. Content can help generate leads via calls to action. Leverage CTAs within your content to generate inbound leads. Social media sites like LinkedIn, Twitter, SlideShare and YouTube are big on lead generation. On LinkedIn, demonstrate your expertise and engage with groups and individuals to identify opportunities for new business. On Twitter, use promoted tweets and Twitter cards to use the site as a lead gen source. On SlideShare, upgrade to a premium account to add a “Get in Touch” button to the end of each deck. On YouTube, create and share videos that provide value to your audience to increase the likelihood they’ll get in touch. When it comes to email, implement email capture initiatives on existing content as well as via newsletter subscriptions to generate quality email lists. Lastly, use the phone to have a conversation with existing clients and connections to ask for introductions and/or referrals. Thanks to social media, the process of nurturing leads has become a lot easier and more accessible. Of course content, email and phone also help. Make sure you’re using LinkedIn, Twitter, Facebook and SlideShare to nurture leads. LinkedIn: Interact with prospects one-on-one and upgrade to a premium account to nurture an unlimited number of leads via InMail. Twitter: Engage with potential prospects and existing clients by sharing content that reinforces your value proposition. Facebook: Connect with potential prospects to interact in a more personal manner (keep abreast of upcoming birthdays, etc.). SlideShare: Post content that salespeople can use in follow-ups and email campaigns. In addition, creating content like case studies can be highly valuable for salespeople during the lead nurturing process. Use this content to communicate your brand value. You can also use email campaigns to communicate with prospects as they make their way through the buying process. Use email to check in with them and share materials like case studies, time-sensitive offerings, etc. Keep in mind that a phone call is often the most effective way to ensure your message is clearly delivered and received. If all of your brand awareness, lead generation and lead nurturing efforts are well executed, you’ll be well on your way to generating sales. Utilize the social media, email, and phone tools in your toolbox for this job. When it comes to generating sales via social media, LinkedIn reigns supreme. LinkedIn is a key asset for salespeople looking to schedule calls or demos with leads. While YouTube videos can help strengthen your pitch, they will rarely be able to sell the prospect in full. Use this platform as supplementary. SlideShare should be used as a tool to deliver demos and facilitate the sales process. Additionally, email will continue to be an incredibly powerful tool for closing sales. Use it to discuss and share proposals and agreements. Lastly, use the power of the telephone. Phone conversations are the closest thing you’ll get to signing a new client in person, so use the power of that conversation to close your B2B deal! With the current range of resources and new technologies emerging everyday, the world of B2B marketing can get very overwhelming very quick! Instead of trying to use every tool for every job, see which works best for each stage of the process for your business and adjust your B2B marketing strategy accordingly. Don’t think of these tools as extra steps, but as lubrication for your buying process to help prospects move through the funnel faster and more efficiently.